Le Parfait like Hoover is a brand name that has come to be applied generically to all products of its type. True Le Parfait jars have been made in France for over 70 years, to the original design, and to the exacting standards demanded by the French gastronome. They are made of pressed glass, and clearly bear the famous logo, be it stamped into the lid, or borne upon the glass itself. 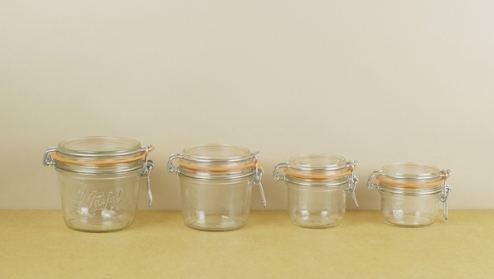 These terrine jars have straight sides to give easier access to, or to allow the removal whole of set terrines and preserves. In 4 sizes 125g, 200g, 350g, and 500g.